#69 "A Newer Swarm of Hornets, The Age of Jets, Attack Tactics"
Modern Tactics: Land, Air and Sea Issue. 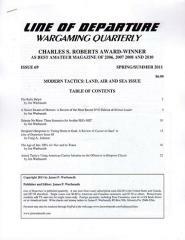 A Newer Swarm of Hornets: A Review of the Most Recent DVG Edition of Hornet Leader. Détente No More: Three Scenarios for Avalon Hill's MBT. Designer's Response to "Going Home to Gaul: A Review of Caesar in Gaul" in Line of Departure Issue 68. The Age of Jets: SPI's Air War and its Times. Attack Tactics: Using American Carrier Aviation on the Offensive in Harpoon Classic .